So, a while back I was contacted by a gentleman from AmmoToGo, asking if I had advertising space on the blog. I responded that yes I do, but that's because my blog readership is small enough that people wouldn't really get a bump at all from any advertising I put up. I'm just an extremely small fish in the blogging world. So the gent wrote back and said "Well, thanks for the honest response. How's about you just do an ammo review for us?" To which I responded back with where he could send the ammo. Which showed up pretty darn quickly, I might add. I should have had this up earlier, but between my multiple physical ailments (October was pretty much a lost month for me, exercise-wise) and TDY trips, the review didn't get done. UNTIL NOW! So, how did I test this ammo? The same way I practice at the range. - me, using an isosceles stance, unsupported, at seven yards. If I can put the rounds on target at seven yards, I can do it at five or three. I don't own a rest. I don't own a chronograph. So I'm not going to get into the specifics of accuracy. 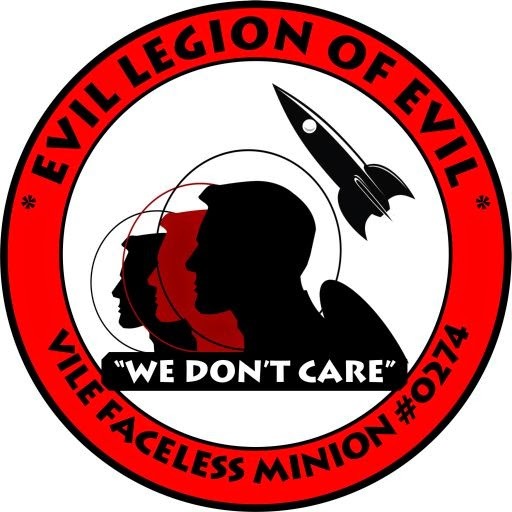 Besides, plenty of other people have done that, and they have the data to prove it. I'm going to talk about how this ammo performed for me in my gun. My pistol is a Taurus PT111G2. Pretty much the previous generation of the Taurus G2C. 9mm, double-stack magazine (12+1), 3.2 inch barrel. I had been somewhat leery about buying a Taurus before I picked this up; everyone has heard the stories about their *ahem* reliability issues. But it was a good price, and at the time I didn't own a 9mm pistol, so I bought it just to see what it could do. I'm happy to say that this gun eats almost every kind of ammo you can throw at it, and the one or two failure to feed issues I had were due to me limp-wristing the pistol. There are pistols with better ergonomics out there, yeah, but in terms of performance? This pistol hasn't let me down once. A big chunk of folks who are skeptical of it are more than pleased once they fire it. And for the price? Can't beat it. I like this pistol so much it's my carry gun when it's cool enough to cover a double-stack 9mm with an overshirt. For anyone scoffing at that last sentence, I have one word for you: Mississippi. Need a couple more words? July and August. Enough said. Now, every firearm has ammo that it likes, and ammo it doesn't like. 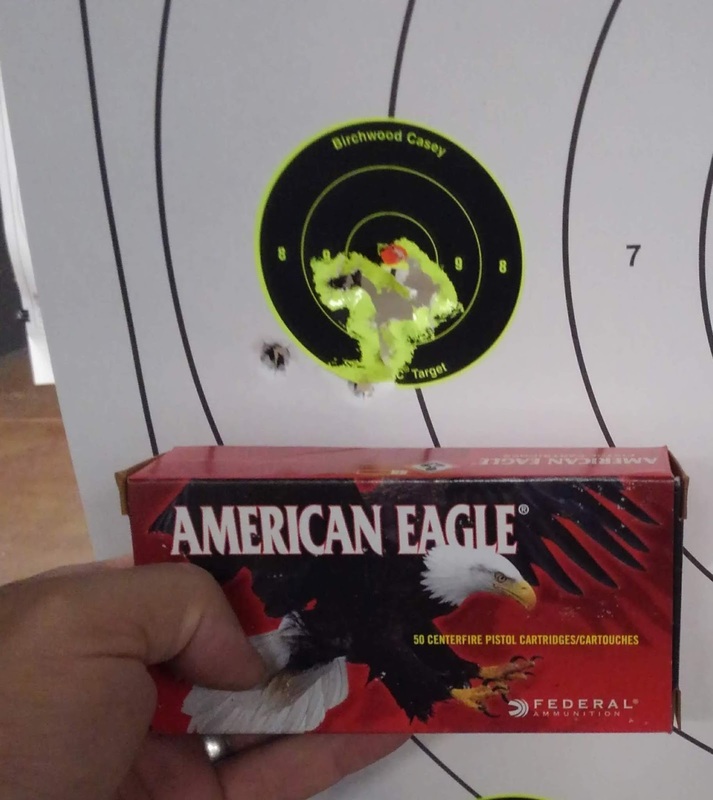 My 9mm pistol doesn't like the Sig Sauer Elite Performance ammo. Does that make it bad ammo? No, it just means that it doesn't perform well in my pistol. Two different pistols will have two different results with the very same ammo. That's just part of shooting. That's why so many competition shooters will spend hours and hours just to tweak their hand-loads to their guns. 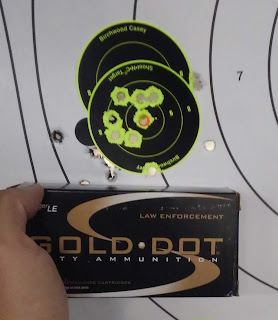 And lots of my regulars are all nodding their heads, saying "No kidding Dave, we know, so hurry the hell up with this already...."
That grouping with the Gold Dot was probably my worst grouping with good ammo, and that's on me, not the ammo. One last group, just to make sure. 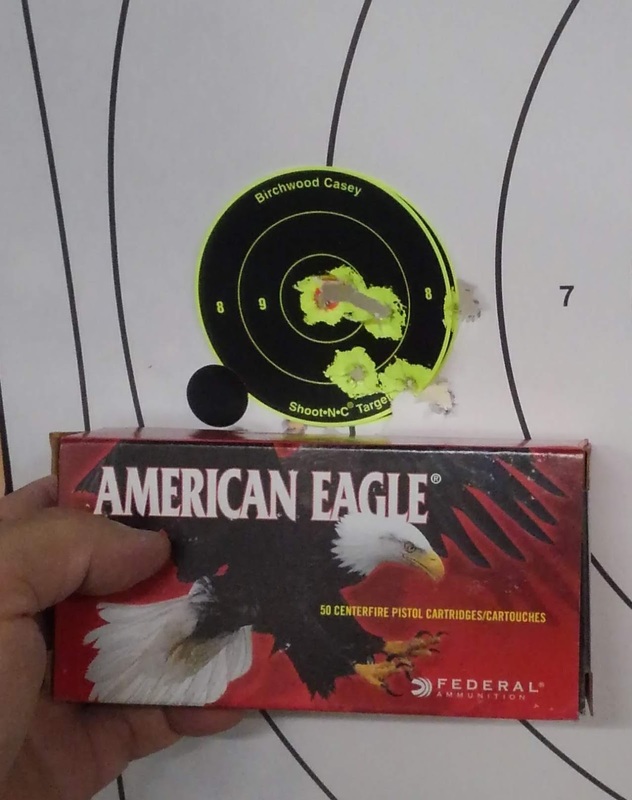 The bottom line is that this ammo is far more accurate than I am. My wife unfortunately didn't get any pictures of her groups. However, she was pleased as punch with the Lawman. This was her first time out with her new pistol, so she was breaking it in, and the Lawman was giving her nice tight groups. Now for the important part: I didn't have a single failure to feed in all the boxes I put through the pistol. Both the Lawman and the Gold Dot were remarkably clean. The Blazer Brass put out copious amounts of smoke, the Federal a little less so. The Lawman and Gold Dot were damn near smoke free in comparison. The Lawman is also a completely encased lead bullet, which means you're not getting any vaporized lead when you shoot. Cleaner range, cleaner gun, and no heavy metal poisoning! Both Speer ammos were easily controllable. 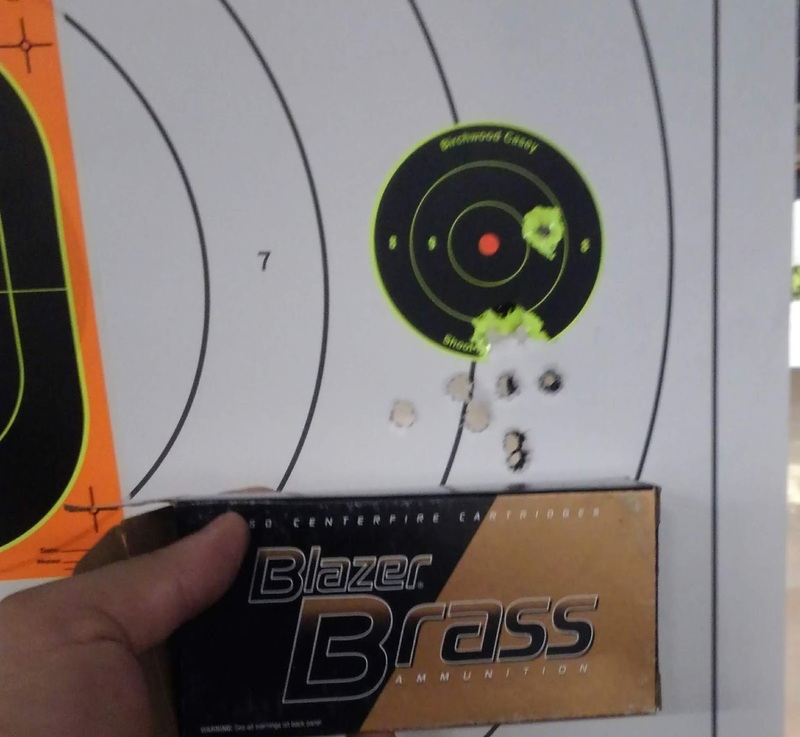 I borrowed the wife's Ruger for a couple of magazines, and her lighter pistol was still easy to keep on target. Both the Speer and the Blazer are made in the same factory, so it's somewhat revealing just how much a difference even a little bit of refinement makes in a type of ammunition. 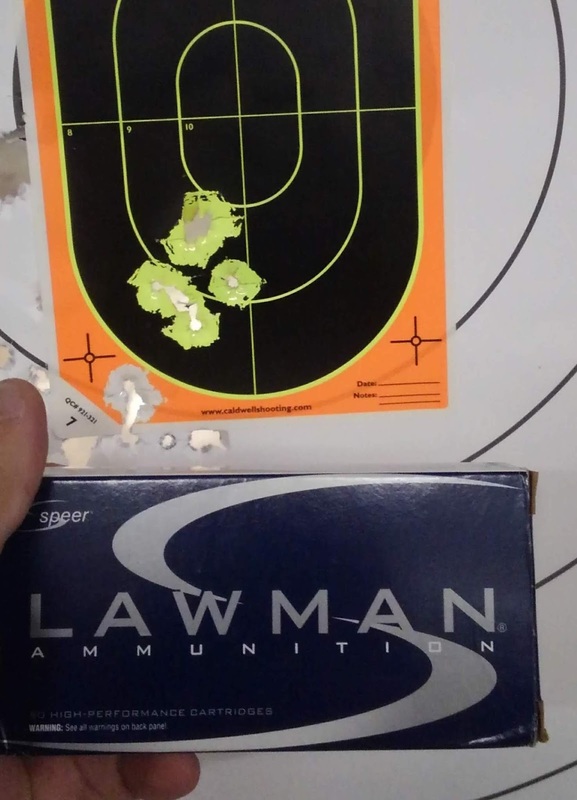 For about a buck or two more, the Lawman gives you much better accuracy. Of course, they're both made in Idaho so I'm a bit biased in my ammo selection. I would buy both of them without any hesitation, and I would note that the Speer Lawman is a under $13.00 at Ammo to Go. I would carry the Gold Dot as defensive ammo with no concerns. It ran through my pistol perfectly, and even when I was pushing my speed of shooting I managed to keep nice groupings with it. 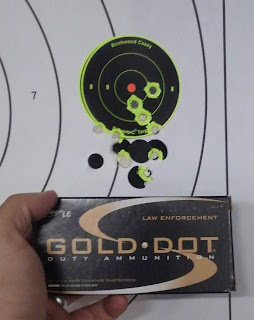 My worst groupings with the Gold Dot could still be covered by my hand. I want to thank Mr. Black at Ammo to Go for giving me the opportunity to test out some ammo and review it here. I'll be looking at Ammo to Go when I want to get a big order of ammunition in the future. 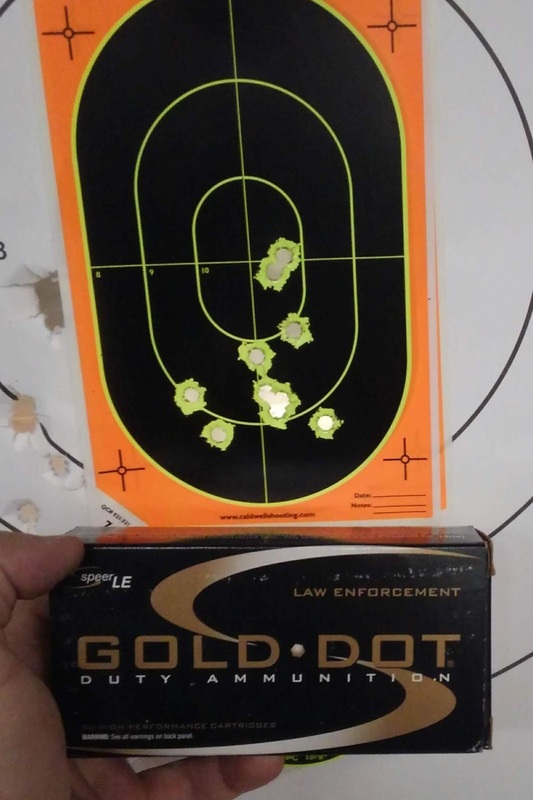 Gold Dot is my EDC ammo. As you said, grouping is good. And for self defense reliability is paramount.